In my prior post "Understanding The Different Types of Lymphoma" I spent a bit of time explaining how there were three main categories of B cell NHL; slow, medium, fast. I encourage readers of this post to review the prior post if coming to this for the first time. The slow lymphomas probably have the greatest number patients falling into different disease categories. I've had a lot of traffic on my website for the intro post so I thought it was time to go deeper into detail for some of the "indolent - aka: slow" lymphomas. For now, I am going to restrict the discussion to the B cell cancers. Many of the T cell disorders that affect the skin are also considered "indolent" but they are really an entirely different discussion probably best saved for later. The most common indolent lymphoma is follicular lymphoma. In fact, this is the second most common type of NHL. In a number of important ways, you can generalize from follicular lymphoma to many of the other indolent subtypes of lymphoma. I've got a few blog posts that outline what I think is the current approach I use to treat the disease (low risk & high risk). Follicular lymphoma comes in many shapes and sizes - there is considerable diversity in terms of patient presentation. It can range from an asymptomatic enlarged lymph node that does not require any treatment - all the way to life threatening cause of marrow or organ dysfunction. I have a number of patients in my clinic who have carried the diagnosis for many years never requiring any therapy. In fact, I have one patient originally diagnosed in the 1950's still chugging away - pretty remarkable. Pathologists determine the diagnosis of follicular lymphoma in several ways. In fact, if you simply hold a microscope slide of a lymph node up to the light, you can often have a pretty good idea that you are dealing with follicular lymphoma. They look for a particular growth pattern (nodular), cell size (mostly small), and can use a handful of special stains (CD10, 19, 20 positive, CD5, 23 negative) or DNA probes (translocation of chromosomes 14:18) to verify the diagnosis. The name "follicular" comes from the "cell of origin." When a b cell runs into the bacteria or virus it was born to fight it goes into the "follicle" of the lymph node. There it undergoes a number of changes to make it a better infection fighter and spits out a bunch of copies of itself. It is a genomically unstable time in the life of a b cell (see my post: why did I get lymphoma) and can give rise to a lymphoma. When lymphoma starts here it is typically either a follicular lymphoma or a diffuse large b cell lymphoma. When I consider a new patient with follicular lymphoma, there are several key features I want to know about before making my management decisions: 1) What stage is the patient? 2) How much disease do they have? 3) How aggressive does it look? Though you might think these three characteristics are all the same, I actually think they are quite different. Stage is fairly straight forward in NHL terms but often misunderstood by a patient who is already shellshocked by the diagnosis. It is quite common for follicular lymphoma to be stage 4 at diagnosis but that is very different than a lung cancer that is stage 4. Since lymphoma is a cancer of the immune system, it is pretty much everywhere to begin with. In contrast, a lung cancer that has spread beyond the confines of the lung and lymph nodes has "metastasized." We don't think of lymphoma as undergoing "metastasis." While stage 4 follicular lymphoma is typically worse than stage 2 follicular lymphoma, I would still take it over stage 4 lung cancer any day. Stage 1 is a single lymph node, stage 2 is lymph nodes confined to one side of the diaphragm, stage 3 is lymph nodes on both sides of the diaphragm and stage 4 involves the marrow. Embedded within "stage" though is a consideration of how much disease a patient has. If a patient has an 18cm lymph node in their abdomen and nothing in their marrow - I still worry more about that patient than the one with a handful of 2-3 cm nodes in the chest and abdomen and a little bit in the marrow. We refer to this as tumor "bulk." It is often a subjective evaluation but one that is important. If there is a single disproportionately large node we begin to worry about transformation. Sometimes a PET scan or additional biopsy is necessary. Aggressiveness is another qualitative / semi-quantitative evaluation. Pathologists will assign a "grade" to the lymphoma that is either 1, 2, 3a, or 3b. This is a measure of how many "large cells" are visible. Large cells are bad as they tend to be more proliferative. The lower the grade the better. Unfortunately there is a lot of variability between pathologists when they try to sort out the 3a/3b's. We are taught to think of the 3b's as the same thing as diffuse large B cell lymphoma. Pathologists can also use a marker known as Ki-67 that indicates how many cells are in the cell division process. Once again, the lower the better. There is a score that does a pretty good job integrating a lot of this known as the FLIPI score. It looks at patient age, stage, number of nodal sites, marrow function (hemoglobin), and a blood test known as LDH. The higher the worse. FLIPI is helpful for allowing us to evaluate results across trials and getting a sense of an individual patient but I still take the other measures as important as well. Anyhow, that is the basics of follicular lymphoma. See my other posts for treatment etc. Marginal zone lymphoma is a lot like follicular lymphoma in terms of how it shows up, behaves clinically, gets treated, etc. There are a few key differences though that are worth pointing out. The first difference is seen by the pathologist. It arises from a different part of the lymph node architecture (any guesses - yes - the marginal zone - which surrounds the normal follicle areas). They often do the same panel of stains on the sample but in contrast to follicular lymphoma, it is negative for CD5, 10, 23, and positive for CD19, 20. They don't necessarily look for the translocations common to other lymphomas like 14;18 in follicular or 11;14 in mantle cell - largely because they are not there. Marginal zone lymphoma comes in three main varieties, nodal, primary splenic, and extranodal mucosal associated lymphoid tissue (Aka MALT). The nodal variety may as well be follicular lymphoma in terms of treatment, prognosis, etc. Some of these can make really highlight how slow these lymphomas can be. Primary splenic marginal zone lymphoma is a little interesting. It can be closely related to hepatitis C. In fact, treating hepatitis C in these patients can even lead to remissions of the lymphoma. Hep C probably gives some growth signals to B cells - so if you get rid of the hep C the lymphoma can go away. It is certainly worth an attempt at Hep C treatment and it should be noted that Hep C treatment is getting a lot more effective. This disease is often also often confused with CLL to a doc unfamiliar with lymphoid cancers. Sometimes you see an elevated lymphocyte count in the peripheral blood, the flow cytometry shows a b-cell cancer, and the doc misunderstands this to be CLL. In the past this might not have been too big of a deal but now that there are some extremely effective CLL drugs, getting the diagnosis right might be more important. Finally the extra-nodal varieties that are associated with mucosal tissues (the lining of the stomach, tear glands, etc) can be interesting because of their associations with paticular infections. The stomach version can be associated with the same H. Pylori bacteria that causes ulcers. Treating the bacteria is often effective at getting rid of the lymphoma. The eye version can be associated with a chlamydia infection (no not the sexual transmitted disease). Here too, treating the infection can cause remission of the lymphoma. Small lymphocytic lymphoma (SLL) is essentially chronic lymphocytic leukemia (CLL) except it affects the nodes more than the blood and marrow. The two disases are so similar we often refer to them together as CLL/SLL. We arbitrarily define CLL as cases with lymphocyte count greater than 5000. In virtually all other ways the two disease are the same. The pathologist will often look at a node and call it SLL/CLL when it stains positive for CD5, CD23, and CD19. The B cell receptor is characteristicly "dim" so any BCR markers such as kappa, or lambda or CD20 are present at lower levels than other B cell cancers. Translocations are not common. Unfortunately the same FISH tests that are so vital in CLL are often not obtained in SLL. Staging can sometimes seem "unfair" to the patient because of how arbitrarily the distinction between the two diseases (CLL vs SLL) are defined. In SLL, staging is done in the same way as follicular lymphoma above. In CLL staging is different though. Stage 0 is elevated WBC, Stage 1 has WBC and enlarged nodes, Stage 2 has the above and an enlarged spleen, Stage 3 has low red blood cells and stage 4 has low platelets. Therefore a SLL patient who has a few nodes and some marrow involvement but a lymphocyte count of 4900 is stage 4 SLL, but if they had a count of 5100, their CLL would be stage 1. It is arbitrary and unfair because they are really the same biologically and calling it stage 1 or 4 sounds a lot worse than it really is. The other thing about SLL that is important and sometimes overlooked is that it should be approached in the way one things about CLL instead of follicular lymphoma. A lot of docs will give lymphoma regimens for SLL when it probably makes more sense to use CLL regimens. I would tend to favor fludarabine based treatment instead of things like R-CVP. It is also important because the new drugs like CAL-101 and ibrutinib are quite active in SLL and should be considered. It isn't totally clear if mantle cell lymphoma belongs in a discussion of the "slow lymphomas." Mantle cell can take on the "incurable" clinical features of follicular lymphoma while sometimes having the growth rates of the more aggressive diffuse large B cell lymphoma. It gets the worst of both. Our knowledge of Mantle cell lymphoma is clouded by the fact that we didn't even recognize this as a discrete type of lymphoma until the mid to late 1990's. Some of the early reports may have been biased by more aggressive cases. More recently, we've come to identify that some mantle cell really can indeed behave slowly. The lymphoma gets started from yet another part of the lymph node - the mantle zone. It stains positive for CD5 but negative for CD23 in distinction to CLL/SLL. Mantle cell does have a characteristic translocation between 11:14 resulting in too much "cyclin D-1" Sometimes this test helps a pathologist determine whether it is CLL or mantle cell. In B cell biology mantle cells arise from B-1 b cells which are similar to CLL. It is therefore interesting to me that the research drugs ibrutinib and ABT-199 look very exciting in this disease since they are also so impressive in CLL. Mantle cell has another few curiosities. It loves the colon. In order to fully stage a patient, it is sometimes necessary to do a colonoscopy and get "blind biopsies." GI docs are often unaware of this so sometimes it requires some physician education. Not every patient needs a colonoscpy but it is common in clinical trials or chasing down symptoms. Treatment of mantle cell lymphoma is all over the map. It can range from transplant to observation. I should probably just save that for another post. Instead of using the FLIPI from follicular lymphoma, we use the MIPI (mantle cell international prognostic index). It uses age, functional status, WBC count, and LDH. The original paper did not use the proliferation rate called the Ki-67 but this is very important (<10%, 10-30%, >30%) and separates prognosis quite well. Waldenstrom's is named after the Sweedish hematologist who characterized the disorder. It is often a marrow only disease that arises from a b-cell en-route to becoming a plasma cell (the type of B cell that gives rise to multiple myeloma). It can involve lymph nodes however so that should not give rise to diagnostic confusion. One unique feature to this disease is that it secretes an antibody into the circulation that can cause a variety of problems. The particular form of the antibody (IgM) is a big / bulky molecule. If the concentration gets too high it can make the blood become too viscous (think olive oil in the refrigerator). In fact "hyper-viscocity syndrome" can be a life threatening situation that requires emergent "plasmapheresis" which is a lot like dialysis. One odd consequence of using rituxan in this disease is that it sometimes leads to a sudden rise in the antibody levels. To the unsuspecting doc, this can be confused for progression. If patients start with a high level of protein, this spike can be dangerous and should be monitored. The protein can cause other problems as well. Neuropathy is not uncommon and sometimes pushes a patient toward therapy they might have otherwise been able to hold off on. Steve Treon M.D. is the guru of this disease and practices in Boston. 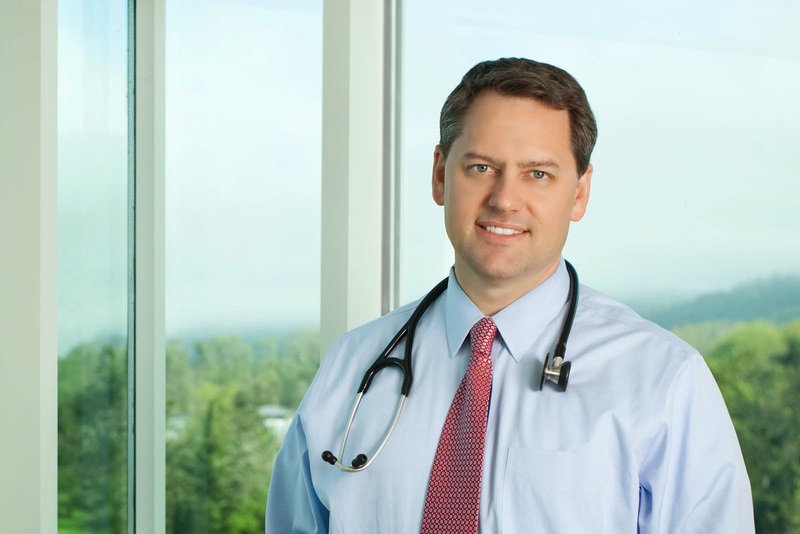 In addition to being extremely helpful to patients and other docs managing these patients, he has done a fantastic job organizing a number of academic centers into a combined research effort. Since the disease is uncommon, it would never get much research attention if it were not for the combined effort of some of the major centers. Many CLL patients identify themselves by their prognostic markers when writing in social media outlets. "Diagnosis age 63, unmutated, trisomy 12, treated FCR age 67, still in remission 2 years later" is the sort of "tag line" I've seen people write. For individuals who visit social sites frequently it is a way to tell your story in a few words. For individuals who are new to CLL, it can all seem very confusing. Well it is about to get a whole lot more complicated for everyone very soon. I've been wanting to write this post for a while but a recent paper has really brought this to the forefront of management of our CLL patients. Unfortunately the names are strange and I worry this post may fall toward the technical side - sorry. I will create a separate post that specifically defines many of these terms. For people who have read all my posts on FISH testing, you are probably aware that it is an antiquated technology that has served us well for 20 years but needs desperately to be replaced. Sequencing technology has advanced incredibly quickly and is now poised to refine our understanding of CLL risk groups with new molecular detail. While most patients are aware of the incredible advances in CLL therapies (ibrutinib, CAL-101, GA-101, ABT-199), fewer are aware of the really important advances in molecular markers that have been recently discovered. Once these are rolled out to the general public we will be able to understand with much more precision how a patients disease will behave. Pretty soon, folks will not only be talking about 13q, 17p without also talking about BIRC3, SF3B1, and NOTCH. Several key findings have emerged from these data sets. 1) CLL has a relatively simple genome. While some "smart cancers" (cancers that quickly gain resistance to our treatments and are far more aggressive) like small cell lung cancer may have 50,000 mutations per tumor, CLL (a comparatively dumb cancer - which is typically slow, responds well to most treatments, does not gain resistance all that fast) may have fewer than 100 mutations per case and only a small fraction of those (around 10-20) affect important proteins (the enzymes that make all things happen inside a cell). 2) Certain mutations seem to be observed fairly commonly in CLL and have some defined prognostic or predictive value. For instance BIRC3 turns out to be a really bad thing to have - it is the new 17p. NOTCH probably is one way to get to Richter's and helps sort out the trisomy 12 cases, SF3B1 makes you resistant to fludarabine chemotherapy. 3) Certain mutations are seen early in the disease, while others seem to accumulate with time. Furthermore, some of the ones present later on are actually present early but only emerge through "clonal selection." 4) Some cases of "familial CLL" (ie those cases that run in families) have an unifying genomic explanation that point toward things we already knew were important. With all of this new information, it was only a matter of time before someone took on the herculean effort to figure out which of these were most important and what they all mean when you analyze them simultaneously in a large group of patients (1300 of them to make this model). Unfortunately, there is a lot of biologic diversity that FISH testing misses since it only looks at large chunks of missing or added DNA. Using sequencing technology (think microscope compared to telescope) as an adjunct to FISH we can now help sort all of these out. Very low risk: Isolated 13q deletions (10 year survival same as age matched controls). There are some really interesting observations contained within this. 1) It is not a surprise that 17p deletion and p53 mutation are both really bad - we've known that for a long time. They commonly run together (ie. most 17p deletions also have p53 mutations - but not all cases). 2) BIRC3 is a new kid on the block. It has only been recognized for about 18 months. Turns out it is really bad to have. It confers chemotherapy resistance and is often very discrete from p53 alterations (i.e., if you have one, your probably don't have the other). We've known for a while that p53 doesn't explain all cases of chemotherapy resistance - BIRC3 explains a lot of them. 3) We have known for a while that 11q deletions often associate with bulky lymph nodes, unmutated B-cell receptors, faster growth kinetics, requirement for alkylating drugs (cytoxan, bendamustine). It has often been considered a poor risk feature. SF3B1 and NOTCH are totally new though and we didn't know where these fit in terms of hierarchy. Turns out, they are about equal. 4) Last year the relationship between NOTCH and trisomy 12 was identified. About half of trisomy 12 cases carry a NOTCH mutation - particularly those with unmutated BCR (ie. cases with unmutated BCR and trisomy 12 have high frequency of NOTCH mutations - sorry if this gets confusing). We have been aware that trisomy 12 was a bit of a wild card - some did fine, some did poorly. Turns out that NOTCH mutations can sort the two apart. Those with mutations do worse, those without mutations are now considered "low risk." I am very eager to learn if the new NOTCH antibodies turn into personalized medicines for patients with the NOTCH (or even FBXW7 changes). 5) Our good old friend 13q is still "good risk." The surprise here is that 25% of 13q cases get put into higher risk categories when you do the mutation analysis. They might have an SF3B1 mutation or BIRC3 mutation you would have otherwise never known about. By carving out the bad players, it makes the good group even better. "Matching age controls" does have some limitations because the model is built upon typical CLL cases. There are probably not sufficient number of 42 year olds with 13q in the model to say that they necessarily match their peers. 6) This model holds true no matter when you evaluate a patient. In other words, if clonal evolution occurs and you go from very low risk to high risk by molecular definition - your clinical outcome changes too. There are some important questions in all of this. 1) The most obvious is - how do I know what I am? Right now - you can't easily tell. There really are not commercial tests to sort this out - I'm trying to make one but seem to running into more walls than doors. If anyone out there wants to finance this idea, let me know! 2) What defines "positive" for mutation? For 17p by FISH we do not define a patient as positive until 20% of their cells are positive. With ultrasensitive testing you may find 0.07% of cells have a BIRC3 mutation. That patient isn't "positive" but I would be very concerned that clone may evolve in the future. Do you therefore do anything different when you choose to treat them? 3) This analysis may miss some of the subtlety of different FISH abnormalities. We already know there are type I and type II deletions on chromosome 13 with different prognostic value. We also know that the overall percent of cells with 11q or 13q makes a difference. This model does not capture that degree of subtlety. 5) How do these markers hold up in the face of the new drugs. ABT-199, ibrutinib, CAL-101, GA-101 are so remarkable. Will traditional markers hold up in the "new era?" It is important to note that this model is based upon cases that have already been followed for quite a few years. Some didn't get rituxan with their first line of therapy. Presumably none were able to take advantage (since it is an Italian study) of the new drugs. By definition, this is a backwards looking model and does not capture what I see as a very optimistic future. For example, 29% 10 year survival for poor risk does not reflect the impressive durable control obtained in front line 17p patients treated with ibrutinib. Though there are questions, the authors of this paper are to be thanked profusely for their remarkable effort to create a single predictive model of this magnitude. I would imagine that there were thousands of hours put into creating and analyzing the data. This paper will serve as a landmark for quite a few years and will help guide countless numbers of patients. The "watch and wait" mantra in CLL can be a test of wills unlike most other cancer experiences. Let's face it, sitting there and doing, "nothing" is hard enough when we are conditioned to believe "early detection saves lives" or "catching it early is your best chance to beat it." Those things are true in common cancers like breast, prostate, colon, lung, etc. but at least for now those do not necessarily hold true in CLL (I hope that will change). Furthermore, the trip to the doctors office takes on new levels of anxiety when the WBC count keeps slowly ticking up - 20 - 30 - 50 - 80. I think a lot of patients see those numbers and experience a lot of angst. How high do you let it go? Shouldn't I do something about it? Watch and wait is hard enough, but getting run over by a steamroller in slow motion seems like a medical version of water boarding. The first thing I tell patients is that there is no single number that tells me it is time to treat a patient. I think many docs start to get uncomfortable when things hit 100 or higher, but for the CLL specialists out there, 100 is often just another number and you will see things periodically go quite a bit higher. I suspect a number of CLL docs take a deep breath when things get much higher than 200 but for a stable patient without other problems - 200 isn't necessarily any worse than 50. I suppose we may need to take extra precautions when you treat someone with a sky high WBC to make sure they don't experience tumor lysis (when too many cells die all at once, it can cause the "gunk" to back up in the kidneys or cause your heart some electrical problems). The highest I've heard of in a stable patient was 500 on one of the ibrutinib studies - I am glad that wasn't my patient - I would have been pretty anxious. In some of the "acute leukemias" which are very different conditions - such numbers would be terrifying. The biology is very different though - 100 CLL cells is very different than 100 AML cells. So if we don't look at a single number - then what should we look at. In clinical trials we use the term, "clinically active disease" as a reason to start treatment. In my mind, "clinically active disease" is largely about trends. Here is where you need some judgement though. It is one thing for a white blood count to go from 20 -30 - 50 - 80 over a two year period. It is another thing all together if that happens over four months. All too often, I hear people get anxious when the wbc goes from 30 to 50 without other changes. When that happens to my patients, I normally look for any signs or symptoms of infection or other abnormalities. I will often repeat it a few weeks later to make sure it is really a trend instead of a "blip." These things can jump around from time to time and I've seen plenty of cases where that 50 went back to 30 and I never knew why. When the WBC doubles over a several month period and that trend looks real / sustained - that is active disease. Often such a patient can still sit tight if other things are holding steady, but chances are that patient is headed for treatment in the next 2-6 months. It is another thing too if it doubles from 30 to 60 (often lots of room to spare) versus 100 to 200 (more likely your marrow might get compromised). Other trends that are VERY important to me are the hemoglobin and platelets. When WBC keeps going up, those will often start to fall. The marrow can only do so much. If it is too crowded with CLL cells, there isn't enough room to make RBC and platelets. Here again, there is no single number that tells me to get started but when there is a sustained trend in the platelets and it gets under 100 or the hemoglobin falls to less than 11 under similar conditions it suggests treatment is coming soon. It is important to make sure it is an "overcrowding" phenomena and not an "autoimmune" situation. Sometimes CLL cells can go on a rampage and make antibodies that destroy RBC and PLT's. This can happen quite suddenly. When a hemoglobin goes from 11 to 7 in several weeks, chances are that is autoimmune. There are other reasons to treat that are not based on trends. Sometimes a patient has overwhelming fatigue, other times lymph nodes can become really troublesome. Sometimes CLL really compromises somebodies immune system and they keep getting significant infections (see video link to Brian Koffman video we did together: Feeling run down from CLL.) Those are fair reasons though somewhat "softer" indications to start on treatment. So why do we wait so long? In the past, our treatments were chlorambucil and fludarabine. There was an old study in follicular lymphoma (close cousin to CLL) where watch and wait was compared to chlorambucil. If anything the chlorambucil patients did a little worse in the long term. The idea took hold that nothing we did ultimately impacted how long a person survived so don't jump too soon. If taking "chemotherapy" didn't do anything more than make you feel better (not a typo), let's make sure you were feeling pretty bad before we got started. I've written in other posts about clonal evolution - another concern for jumping in too soon. One important thing to note however is that it can be very difficult to show that ANYTHING improves survival in CLL. For a condition that can often last over a decade, it takes a long time to prove your point. Even with the most exciting new research drugs, we may not see that they improve overall survival for average CLL patients for another 10 years! Things have started to change though. Two studies in the past few years have shown we can improve overall survival in CLL (both started quite some time ago). Frontline fludarabine keeps patients alive longer than frontline chlorambucil in patients needing treatment and the Germans have shown us that FCR keeps patients alive longer than FC. Those are milestone studies, yet I think the real change will happen when we get to a place where we have effective biologically informed treatments that are not chemotherapy based. We are spoiled to have a substantial number of these working through clinical trials now (ibrutinib, GS-1101, GA-101, ABT-199, and others). My personal conviction is that once we can start combining some of these treatments we will really be off to the races with the "new era in CLL." In follicular lymphoma, things are changing for the better. Rituxan is "biologic therapy" that is a pretty effective treatment that does not necessarily need to involve chemotherapy. 70% of patients will respond to rituxan and disease control can be quite durable for some patients. Unfortunately, as a single agent, it is not nearly as effective CLL. There are always exceptions to the definition of "active disease" I outlined above. I watch my patients with 17p a little more closely and may jump in a little earlier. I don't know that I am right for doing this, but I think a lot of docs do the same. Since these cells can be so resistant to treatment it might not be a good idea to collect so many of them before getting started. The same is true for 11q minus patients but perhaps not to the same degree. Another thing to consider is that patients with "unmutated" cells might on average go up faster than someone with "mutated" cells. Things also change in patients with relapsed disease. It is not uncommon to see faster kinetics with relapsed disease (see clonal evolution post). Also, over time, lymph nodes become more problematic. Keep in mind that CLL cells in bone marrow and lymph nodes are considered more difficult to eradicate than the ones in the circulation. I think docs tend to jump on relapsed disease a little earlier than they do in untreated patients - even though the indications really do not change. We spend a lot of effort as docs and probably freak out a lot of patients by looking at all sorts of expensive prognostic markers (BCR mutation status, b2 microglobulin, CD38, ZAP-70, etc.) Ultimately, we try to use these to tell us what the trends are going to look like in the future. Better yet, get an old blood test from the last time you had blood drawn. It is very common for me to meet a patient, dig up a three year old blood test and point out that their CLL was present way back when, just not enough to trigger the alarm bells. I think a lot of patients are relieved to know things haven't really changed a whole lot over a several year period. Anyhow, hope that helps explain how I think a lot of docs think through this sort of question. ASH abstracts are out. I recently posted on how to carefully evaluate the news. Over next several weeks I want to draw attention to those abstracts that I think are most noteworthy. In the meantime, I thought I would put the links to the studies our center has participated in. Most of these represent collaborations with leaders in CLL and NHL. It has been a good year in CLL/NHL and I think we are really on the verge of substantial change in the field. In contrast to the debate about how to select initial treatment for patients with follicular lymphoma, treatment in DLBCL is considerably more straight forward. These two lymphomas represent the most commonly diagnosed subtypes of NHL. For further questions about thedifferent types of NHL link here. Most patients with DLBCL are going to be treated with R-CHOP. I have a lengthy post about this regimen that describes the regimen in detail for the interested reader. There are a number of considerations that may individualize therapy for some patients so it is not just a blanket – one size fits all. When R-CHOP is the selected regimen, several important questions need to be asked. The first question is “how many cycles.” In most patients the answer will be six. I normally repeat CT scans after cycles two, four, and six. If the patient still has measurable disease and it continues to shrink between cycles four and six – I will occasionally go to eight cycles – but that is definitely the minority of patients. You cannot continue R-CHOP indefinitely because the “H” which stands for “hydroxydoxorubicin” aka “Adriamycin” can be hard on the heart and you can only give so many doses before running into long term cardiac issues. For the less common patient who shows up with “limited stage” (ie. Stage I or stage II disease mostly in one spot), you can consider a shorter duration of R-CHOP when combined with radiation. Usually 3 cycles followed by radiation is enough. Sometimes that is more difficult when the site of disease is less agreeable to radiation such as in the colon. I will also use radiation in patients who present with stage III, or IV disease provided there was one spot that was particularly bulky at the start (>10cm) but this is a little more controversial. This tends to reduce the likelihood that disease will relapse at the same site of disease, but does not necessarily prevent distant spread of the lymphoma. The next question is whether a patient is at risk for their lymphoma coming back in their brain. Since chemotherapy does not get into the brain very well, it is a site of relapse in a minority of high risk patients. This includes patients whose initial disease started in the testicle, the nasal sinuses, or someone who has a lot of disease outside of their lymph nodes (what we call extra-nodal disease). For those patients with high risk of CNS relapse, we have the option of administering a shot of a drug called methotrexate by way of a lumbar puncture. When done by our radiology colleagues using fluoroscopy, this doesn’t typically bother a patient too much. The problem with methotrexate is that we really don’t have a lot of confidence that it works particularly well. It is one of those things we do by convention when what is really needed is a change of convention. Some docs will actually give a much higher dose of methotrexate into a vein. The dose in this situation typically requires the patient be admitted to the hospital for a few days. This may be a more effective strategy, but obviously a lot more difficult to perform. There are circumstances where R-CHOP may not be a good idea for a patient. In patients with prior exposure to Adriamycin (perhaps for a breast cancer many years ago), or who are starting with a bad heart to begin with, you may need to substitute the Adriamycin for something more “heart friendly.” Sometimes these substitutions are done for patients that you think might be a little too old or fragile to handle R-CHOP. I did recently treat a 92 year old with DLBCL giving him six cycles of R-CHOP. Granted, he was still out there chopping wood – but another example of where age does not equal limitation. He is two years out from therapy now and just celebrated his 70th anniversary – way cool! There are a number of ways to do swap things around. I know some docs who use a different formulation of Adriamycin known as “Doxil” which is more heart friendly. Others have used a drug with a lot of similarities to Adriamycin known as mitoxantrone. Unfortunately, this substitution reduces efficacy and it isn’t totally clear that it protects the heart all that much. I have periodically used a substitute for Adriamycin known as etoposide. The published study for this is pretty old and I cannot be certain it is a great substitute. I try to use R-CHOP as much as I can, but sometimes you just have to avoid the Adriamycin. Another key group of patients for whom I choose a different path are the patients with “double hit” lymphoma. I need to explain some biology here. There are common DNA abnormalities in DLBCL. The most common is where a gene known as BCL-6 gets abnormally activated by getting the chromosomes rearranged, resulting in excessive protein. This can happen with other genes including BCL-2 or Myc. When a lymphoma has two of these (most commonly Myc and one of the others), we think these patients do not do as well as our more common “single hit” DLBCL. Most scientists agree this group is considered “higher risk” but what to do about it is less agreed upon and subject of practice patterns not necessarily scientifically proven to be any better. When Myc in locked on, the cells cannot stop dividing. We see exceptionally highly proliferative tumors in this setting. We can measure a “Ki67” which is just a marker for dividing cells. While normal DLBCL might be anywhere from 40-80% of cells staining positive, Myc affected cells are almost always > 90%. Myc is also a hallmark of a particularly aggressive version of lymphoma known as Burkitt’s lymphoma. Unfortunately, if you show microscopic slides of very aggressive lymphomas to a bunch of pathologists, you will find a surprising degree of disagreement as to whether a lymphoma is Burkitt’s or DLBCL. In fact there is even a new category known as “Aggressive B Cell lymphoma with features indeterminant between Burkitt’s and DLBCL.” The main point for me, is that we sometimes under-diagnose either double hit lymphoma or it’s close cousin Burkitt’s and instead call it DLBCL. Clinical science gets a little thin here so please do not take the following as the only acceptable strategy. For those patients with highly proliferative tumors, I will use a regimen that has been studied in both DLBCL as well as Burkitt’s. The regimen is known as “R-EPOCH” A lot of the letters (as well as the drugs) are actually the same. In fact, there is only one new drug – etoposide. The main difference is that all the drugs are infused over four days through a pump followed by some injections on day five. This is different than R-CHOP which is commonly given over just one day. Since the regimen is good in Burkitt’s as well as DLBCL, I use it when there is gray area with the diagnosis. I cannot say that this is definitively the right thing to do but I know a number of academic physicians who do the same. There is a large research study currently comparing R-EPOCH to R-CHOP but it is accruing slowly and I don’t know if it will ever give us the answer as to which regimen is the best. R-EPOCH is also my preferred regimen for those patients with HIV who have been diagnosed with DLBCL. This is a unique subpopulation that used to be a lot more common than it is today. There have been a number of studies using this regimen in this setting. Hopefully that should cover a number of questions about how to select a front line regimen in DLBCL. It is not meant to be a replacement for your own doctors advice but hopefully give you confidence that your doc is on the right track. I hope I’ve highlighted where things are pretty clear and where they are controversial so that any differences in strategy might be explainable. It seems like we hear a lot about clinical trial results that are “significant.” Yet, in many cases it feels like the outcomes of certain diseases really are not changing all that much. ASH abstracts will be out in the next few weeks and it is always a time for news. Unfortunately, much of the news is poorly reported because the language of science is not always the same as the language of the rest of the world. Nowhere is that more important as the word "significant." When the headlines scream "significant" it really helps to understand what is actually being communicated. We often trumpet a study that has achieved a level of improvement to be considered “statistically significant” yet what that really means is that when two or more interventions were compared, the difference in outcome between the interventions is unlikely to have occurred by chance (or more accurately stated, likely to have occurred by random chance <5% of time should the study be repeated multiple times under similar circumstances). The problem with this definition is that a small difference between interventions (say an improvement in response rate from 33% to 38% or improvement in survival from 11 months to 12 months) can be “statistically significant” if it is observed in a large enough population whereas most patients might say – “who cares if it is such a small difference.” This is a key point, so I want to make sure it is clear. If you see a 5% difference in a study population of 70 patients, you might agree that there is a good chance the difference is purely random. On the other hand, if you see a 5% difference in a study population of 10,000 patients – chances are that is a real / reproducible difference. In the latter case, we would call that “statistically significant” even if the patient says, “so what.” Take a 50% difference in outcome however, and even if it is observed in a small population, it is a big enough difference to make you think it isn’t a random chance observation. When we design studies we go through an exercise known as “powering the study” which enables us to project a difference between two interventions and then calculate how many patients we will need to study to enrolled to conclude that our difference is “statistically significant.” If we project that a new treatment improves response rate from 20% to 80% that is a huge number and we need few patients to prove our point. Similarly if we double the duration of response with a new treatment – that doesn’t take many patients either. When the difference is small though, the studies have to get very large. That is true when we already have very effective treatments (hodgkin’s disease) and you don’t have a ton of room for improvement (ie, can’t cure 130% of patients) or the incremental benefit is small (different hormone manipulations in breast cancer improving outcome by 1-2%). One good clue to how meaningful a result is is simply to look at how many patients were enrolled. If you have > 500 patients per arm, chances are the improvement is fairly modest. Patients want “clinically meaningful” results such as “Dad survived 6 years instead of 6 months with his pancreatic cancer” or “everyone who takes the new drug feels better and responses are dramatically improved.” Who could blame patients for wanting this. Over the past 50 years most of our advances have fallen into the “incremental gain” category. This is where we had huge studies to show that we could prolong pancreatic cancer survival by two weeks on average and this was trumpeted as “statistically significant” – yuck! We’ve had a bunch of these recently in colon cancer. Seethis link for a very good article about this. Sadly, the route to approval of drugs requires “statistically significant” even if it is not “clinically significant.” Of course, a new drug is going to be very expensive and if you have to take $90,000 of treatment to prolong life by several months, you might think twice if you were paying for it (provenge in prostate cancer). The British have a system that measures “clinical significance” as part of their approval process. I have to say that I can see some logic there – please look at this link for more. I am pleased that many of the experimental treatments in CLL fit the category of “clinically meaningful.” It is important to note that randomized studies to measure the magnitude of difference have not been completed with ibrutinib, CAL-101/GS-1101, ABT-199, GA-101 and so forth – but they are underway. Many thought leaders feel these agents will be both “clinically significant” and “statistically significant” to boot. Hopefully we will gain broader access to these soon and patients will live longer, happier lives. ASH abstracts are just around the corner. You will probably hear a lot about “significant” results. Pay close attention to the use of the terms “statistically significant” and “clinically significant” – they are different. Look for how large the sample size is in the study. Lymphoid studies tend to be smaller than breast / lung studies. A big lymphoma study or CLL study might be >500 patients. Keep in mind that you cannot define “statistically significant” unless you are comparing at least two groups – so they are either randomized studies or looking at subgroups within a larger study. Hopefully we will have a lot of studies to discuss that really improve the quality of lives for patients with these disease. I've written once previously about clonal evolution, but I think this is really an important topic and so I wanted to come back to it again. There is a wonderful new technology called "next generation sequencing" that is turning cancer biology upside down. The human genome project took 13 years, 6 billion dollars, and sequenced (ie measured every single piece of human DNA) the genome of four healthy individuals. That is a lot of time and money. You can now do the same (actually much more) amount of work in about 2-3 weeks at a cost getting closer and closer to $1000. 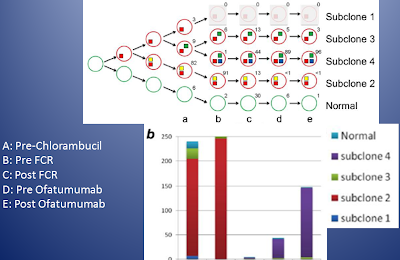 This looks at an individual with CLL who had their cancer cells sequenced at 5 different timepoints in their disease. I suspect this is true in lymphoma as well, but tissue is harder to get. For now, assume this applies to both diseases. At the first timepoint analyzed (a) there are already three "subclones" and a population of normal B cells. The patient gets treated with chlorambucil and at timepoint (b) which is relapse following treatment, one clone has taken off as the major one (91%). The patient then gets treated with FCR and overall the disease largely goes away. Subclone 1 goes away forever. Unfortunately subclone 4 which was only 1% of all the cells prior to FCR really takes off and becomes the clone that eventually causes the patient to get into trouble. This highlights how the behavior of disease can change over time. Different subclones may acquire different mutations (17p, 11q, BIRC3, SF3B1, NOTCH, etc.). Though it may be lurking in background, it can become the predominant clone when exposed to therapies that eliminate the "easy disease." 17p is the genomic alteration in CLL that triggers the greatest concern in most patients. It can have a tremendous impact on CLL prognosis and the FDA has recently extended approval to ibrutinib in this population (even without prior treatment) and the European equivalent of the FDA (the EMA) will do the same for idelalisib in combination with rituximab. A lot of patients know that 17p deletions is one of the high risk markers in CLL – but there are a lot of things to consider about CLL with 17p deletion before completely tearing your hair out. When we say 17p deletion CLL, what we mean is that the short (petit) arm of chromosome 17 is missing. You have 23 pairs of chromosomes (46 total) and as you get higher in the numbering, the chromosomes get smaller and smaller. It is probably an excessive simplification to say that the biology of 17p is all about one particular protein called p53 – but for the time being that is most of the story. P53 is affectionately called “the guardian of the genome.” Every time I read about p53 I discover some new function of the protein that I didn’t know about before. One of the most important though is that it will bind to DNA in a bunch of places and turn on / off the genes at those locations. In this role it is known as a “transcription factor.” Many of the proteins that are regulated by p53 have to do with cell survival or cell death. When P53 decides it is time for a cell to die – very few things can stop that. The most important signal that turns on p53 is DNA damage (hence – guardian of the genome). When DNA damage occurs the cells have a lot of repair mechanisms to try to fix the problem (including the ATM protein on chromosome 11q). P53 will halt cell proliferation until that DNA damage is fixed. Some DNA damage cannot be easily fixed and when that is the case, p53 triggers a cell death cascade called apoptosis (one of several ways that cells can die). I mentioned above that you have two copies of every chromosome – so you ought to have two copies of P53. We have been good at detecting absence of chromosome 17p for quite some time (via routine cytogenetics or FISH), but we have not always been very good at detecting p53 mutations which have been far more difficult to measure until recently. With new sequencing technology, it is relatively easy to look for mutations and an increasing number of laboratories are offering that service. This is important because patients with 17P deletion are not the only individuals who have to be concerned about it. About 30 percent of patients with abnormality in P53 have a mutation BUT NO DELETION. Those have just as bad a prognosis but are not currently detected by FISH testing (nor SNP arrays which are one newer technology that is gaining popularity). There is a strong association between loss of chromosome 17p on one chromosome and mutation of the other copy (about 85% of cases with 17P deletion will also have P53 mutation on the other chromosome). Another common misunderstanding has to do with “how many deleted cells does it take to call a patient 17p deleted?” In other words, FISH will report the percentage of cells lacking one copy of 17p. That can range from 1% to 100%. In simple terms, the more abnormal cells, the worse. For research purposes we say that 20% of cells lacking one copy of 17p calls that person “17p deleted.” Some labs have lower thresholds (7%). Occasionally I will hear from a patient that has 2% of cells with 17p deletion who is worried about their future. By convention we would not group that patient into a 17p deletion category. I think the 20% distinction is important – but gets more emphasis than it deserves. We have prior posts talking about clonal evolution and this is a topic that is very important to understand (also covered in my "watch and wait" post. If you have a small percentage of 17p deleted cells and you get chemotherapy that damages DNA – requiring p53 to transmit death signals – guess which cells are going to survive. We know that one out of five patients will have a high risk molecular abnormality at relapse (11q/17p). If we look hard enough we can see that it was often there to begin with – but below our typical levels of detection. By giving therapy that removes the more sensitive cells, the resistant ones remain. On the other hand, if you have a large number of 17p deleted cells, you are less likely to respond to chemotherapy in the first place. Campath (an antibody that does not damage DNA) can work well, but does not clear bulky lymph nodes which are common with 17p deletion. High dose steroids can shift cells into the circulation where they can be removed by campath. Rituxan also does not damage DNA both rituxan and campath combine well with high doses of steroids. I have a particularly memorable patient who presented to my clinic with bad stage IV 17p deleted disease. He had bulky nodes, WBC count of 200, platelets of 20k and hemoglobin of 8. His FISH showed 100% 17p deleted. Two cycles of FCR did nothing except get him transfused every few days. I switched him to campath with rituximab and got his marrow into better shape but he still had bulky nodes. He was young enough for transplant, but not eligible because he still had bulky nodes. I sequentially gave him R-ESHAP, bendamustine rituxan, revlimid rituxan, ofatumumab all without much benefit. I started him on CAL-101 and his disease melted away. His disease control lasted nearly two years. When a patient is young enough, they should definitely consider a stem cell transplant for 17p deleted disease. The challenge though is that CLL more commonly affects patients too old for transplant. The engineered T cells hold some promise for being active in this setting. I also have a lower threshold for starting treatment in previously untreated CLL with 17p deletion (see "when to treat CLL"). Since those cells are likely to be resistant, I don’t see value in getting too far behind before getting started. When I start, I might avoid FCR though some would argue it is still the right choice (NCCN lists this as first choice but I do not agree). In Europe, you would typically get steroids with campath and I tend to think that is the right option. Unfortunately, not enough sound data to tell us one regimen is better than another in this situation. If a patient has access to ibrutinib in this setting that may be preferable. Finally – one more biologic consideration. Richter’s transformation is the name given to CLL that changes behavior and becomes a lot more aggressive – a different entity we call diffuse large B cell lymphoma. It appears that p53 abnormalities are one of several key steps to getting to Richters (the other possibly being abnormalities in Myc or a protein that turns on Myc called NOTCH). This is part of the reason Richter’s can be so difficult – it has intrinsic resistance to chemotherapy. We are lucky to have a host of new drugs working through the system. I will be very interested to see if drugs work out in this setting!